NOTICE: Activation key must be used on a valid Steam account, requires internet connection. ABOUT THE GAME	Dive into the Middle Ages and play the successor to the worldwide #1 hit, Bridge Constructor. Bridge Constructor Medieval turns back the clock a few centuries to the time of knights and castles. Build sturdy bridges to supply your city with provisions - or cunningly constructed bridges th… at collapse under the weight of attacking troops, sending the horde of enemies into the abyss below. You won’t even be safe from cannon fire in the 40 brand new levels. Protect your foot soldiers and your horse-drawn carriageswith covered bridges and stable pillar structures. There are a total of five materials available to help you build the perfect bridge: wood, heavy wood, stone and ropes, along with the new addition of the bridge roof. Throughout the exciting background story, you will familiarize yourself with the various materials on a step-by-step basis, and learn everything you need to know so that your bridges meet the requirements of the different levels. Innovative game modes in store for you! Besides building stable bridges, there's also plenty on offer for veterans to discover in the new game modes. In the siege level, your bridge is bombarded by enemy catapults. Strengthen your bridge so that it doesn't collapse, and protect your own troops on the bridge with a bridge roof. In another new game mode, you build your bridges so that they collapse under the load of enemy units to send as many of them as possible into the abyss. In addition, the unique bonus challenges will leave even the most experienced players at their wit’s end. 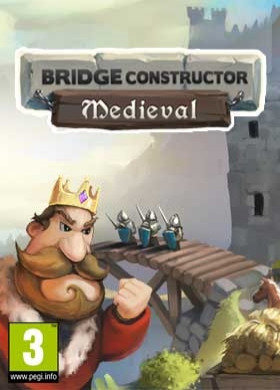 That way, both bridge-building professionals and novices will face a challenge in Bridge Constructor Medieval.KEY FEATURES For the first time: Build bridges in the Middle Ages! Brand new levels and game modes for a completely new gaming experience Design sturdy bridge roofs to protect yourself from enemy catapults Construct cunning bridge traps to send advancing enemy troops into the abyss Exciting and funny background story Enjoy beautiful medieval landscapes	Levels: 40 new levels SYSTEM REQUIREMENTS Windows Minimum: OS: Windows XP, Vista, 7, 8 Processor: 1,8 GHz Memory: 1 GB RAM Graphics: DirectX9 compatible with Shader Model 2.0	Mac Minimum: OS: Mac OS 10.6 Processor: 1,8 GHz Memory: 1 GB RAM Graphics: DirectX9 compatible with Shader Model 2.0Linux	Minimum: OS: Ubuntu 12.04 or equivalent (32bit or 64bit with ia32-libs installed) Processor: 1,8 GHz Memory: 1 GB RAM Graphics: Linux 64bit users need to have ia32-libs package installed (sudo apt get install ia32-libs) (c) 2014 Headup Games GmbH & Co. KG, all rights reserved, www.headupgames.com, ClockStone and its logos are trademarks of ClockStone Software GmbH.